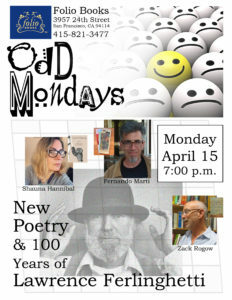 Shauna Hannibal, Fernando Martí, and Zack Rogow, three poets with new collections, read from their work and from the work of Lawrence Ferlinghetti at “New Poetry & 100 Years of Ferlinghetti,” the Odd Mondays for April 15. Celebrate National Poetry Month and Lawrence Ferlinghetti’s first century at Folio Books, 3957 24th St. in Noe Valley. 7pm start. Free admission and free refreshments–including birthday cake! Zack Rogow is the author, editor, or translator of more than twenty books or plays. His poetry collections include Irreverent Litanies; as well as The Number Before Infinity, and Talking with the Radio. His coauthored play Colette Uncensored had a staged reading at the Kennedy Center in Washington DC, and ran in London and San Francisco. Rogow’s blog, Advice for Writers, has more than 200 posts. He serves as a contributing editor of Catamaran Literary Reader.